1. What is a District? a. Who runs the District? b. What is the difference between a District and a Council? Of what Council is Orange Mountains District a part? c. What is a Unit Commissioner? d. What municipalities does Orange Mountains District serve? e. When are the next district-sponsored events? f. How do I get involved in my district? How do I get involved in a local unit? g. What is my District doing to ensure Youth Protection? a. What requirements are used? b. Does the District regulate or become involved in the advancement process of a Scout? 1. What is a District? A Scouting District is a collection of units within a geographical area determined by the council executive board of the local Council of the Boy Scouts of America. District leaders mobilize resources to ensure the growth and success of Scouting units within the district's territory. All districts are responsible for carrying out four standard functions: Membership, Finance, Program, and Unit service. The membership function strives for growth through the organization of new Scouting units and growth through new members joining existing units. The finance function sees that the district provides its share of funds to the total council operating budget. The program function concentrates on helping Scouting units with camp promotion; special activities, including community service; training adult volunteers, youth advancement, and recognition. The unit service function provides direct coaching and consultation by district volunteers for unit adults to help ensure the success of every Scouting unit. Members of the district committee carry out the membership, finance, and program functions. The district commissioner staff carries out the unit service function. The district chairman is a member of the council executive board. The district commissioner meets with the council commissioner and other district commissioners on a regular basis. The chairman of each district operating committee may be a member of the corresponding council committee. a. Who runs the District? The District is run by a Committee consisting of dedicated Scouting volunteers. The current District Committee roster may be found here. If you are interested in volunteering your time to the District, please contact the District Chair. b. What is the difference between a District and a Council? Of what Council is Orange Mountains District a part? 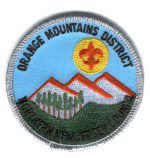 Orange Mountains District is a part of the Nothern New Jersey Concil (NNJC) of the Boy Scouts of America. The NNJC (http://www.nnjbsa.org/) supports 892 Scouting units representing Bergen, Essex, Passaic and Hudson Countines in Northern New Jersey. Orange Mountains is one of more than ten Districts in the NNJC. c. What is a Unit Commissioner? A Unit Commissioner is a volunteer like you with some background in Scouting and the ability to empathize with and undertstand the problems unit leaders face when operating Scouting programs. A Unit Commissioner provides service to one or several units and becomes their main contact in the District. By visiting units on a regular basis, the Unit Commissioner will help relay the units' needs to the top District officials, who cannot always visit all units in the District. Therefore, the Unit Commissioner plays a key role in keeping units strong. Our units need your help and expertise. If you have been involved with the Scouting program (preferably for some time), you have the benefit of experience that others do not. Think back to your earliest memories of Scouting. You were new and green, full of enthusiasm but requiring practical knowledge and application. Maybe somebody helped you, maybe they did not and you had to feel your own way until you were able to go to Training. It does not have to be this way for other volunteers entering Scouting leadership. By serving as a Unit Commissioner, you help new leaders make the right choices and gain experience without sacrificing elements of the program that cause the Scouts to lose the benefits of the Scouting program. Contact your District Commissioner today if you are interested in becoming a Unit Commissioner, and Thank You to all who have served in the past. d. What municipalities does Orange Mountains District serve? Our district proudly serves Scouting units in the Northern New Jersey communities of East Orange, Irvington, Livingston, Orange, Maplewood, Millburn, Short Hills, South Orange and West Orange. e. When are the next district-sponsored events? This webpage contains a District calendar as well as information about upcoming events. If you require more specific information, please feel free to consult the Chair of the appropriate committee, the contact person for the event, or the District Chair. f. How do I get involved in my district? How do I get involved in a local unit? Volunteers are essential to all levels of Scouting. To volunteer in the district, click here and contact the District Chair, or the chair of the committee in which you would like to serve. To get involved in a local unit, check with your local place of worship or community organization to see if they sponsor a Scouting program, or contact the District for more information about a Scouting unit near you. g. What is my District doing to ensure Youth Protection? The Boy Scouts of America and Orange Mountains District are absolutely committed to ensuring youth protection. Youth Protection Training is a vital element of the Scouting Leader training process. In addition, Orange Mountains District maintains a Youth Protection Team headed by a Youth Protection Coordinator. To learn more about Youth Protection initiatives, go here and contact the District's Youth Protection Coordinator. 2. What is Advancement? Advancement is the process by which youth members progress from rank to rank in Scouting. Ranks are simply a means to an end, not an end in themselves. Everything youths do to advance and earn these ranks, from the day they join Scouting until the day they are no longer of age to advance, should be designed to help them have an exciting and meaningful experience. Education and fun are important functions of the Scouting movement, and they must be the basis of Scout advancement. A fundamental principle of advancement is that youth members will progress as a result of participation in the unit. In a unit with a good program, youth will advance naturally as a result of unit activities, and by taking advantage of the available advancement opportunities. 1. The boy learns in meetings, in activities, and on his own. 2. The boy passes badge requirements in a natural way, as successful completion of each requirement is demonstrated. 4. The boy gets the badge and is recognized for his achievement. a. What requirements are used? The Boy Scouts of America provides a full list of requirements for Scouting ranks in such basic publications as the Scout Handbook. These requirements are generally standard for all youth in the Boy Scouts of America program. b. Does the District regulate or become involved in the advancement process of a Scout? Yes. While most advancement is regulated by volunteers in the unit to which a youth belongs, as well as by trained merit-badge counselors, District members may serve various advancemnt review or aid capacities for a unit, and the District is involved more intimately when a Scout is completing work for his Eagle Scout rank. 3. What is Venturing? To learn more about Venturing, click here to read the text of the "What is Venturing" Fact Sheet, No. 02-388. 1999 Printing.